The amazing thing about the album is Rafaell Altino himself. This fine musician simply lifts all six pieces so high that it becomes a six-hearted performance. I. Overture 2:07 6,40 kr. II. Far Horizon I 2:42 6,40 kr. III. Prelude 1:17 6,40 kr. IV. Fugue 3:29 6,40 kr. V. Cadenza 1:57 6,40 kr. VI. Far Horizon II 2:00 6,40 kr. I. Adagio 6:18 9,60 kr. II. Allegro con brio 6:04 9,60 kr. Recitare I 6:31 9,60 kr. Recitare II 5:36 9,60 kr. It was felt deeply enough by Bach, Mozart, Beethoven, Britten and Hindemith for them all to adopt the viola as their instrument of choice in performance. The viola gave those composers an inside track on the workings of ensemble harmony and part writing. But their receptive ears were also attuned to the big-bodied instrument’s particular tonal qualities, sounding a perfect fifth below the violin: its solemnity, mellowness, eloquence, introspection, depth, reediness and distinctive chocolatey warmth (the list of adjectives goes on). Those composers offer plenty of ‘viola moments’ – fleeting instances of deep expression, in larger scores, that show how nobly the instrument stands in relief against its companions (stringed or otherwise). But composers who have never had a viola under their chin have given us such moments too, and more. Berlioz deemed the viola passionate enough to lead the adventures of his orchestral work Harold in Italy. Schubert gave it a special place in Death and the Maiden. Strauss cast it as the earthy Sancho Panza in his orchestral take on Don Quixote. When Pfitzner wanted to convey the title character’s muted despair at the end of his opera Palestrina, he turned to the viola. Naturally, viola players themselves have often assumed the characteristics of their instrument. If nothing else, the job of playing the viola ensures it. In reams of repertoire, the viola provides little more than harmonic filling. Viola players, once known in the orchestra as ‘third violinists’, have smiled graciously through a century’s worth of cheap jokes cracked at their expense. Through it all, they have retained a form of proud, dignified composure. They know, to quote Koll again, that their instrument is that of ‘the inner soul; of despair, of distorted feelings, of suppressed revolt.’ The revolution might not be over, but at last, the viola is deemed worthy enough to stand and be played on its own. Like Bartók, Walton, Hindemith and Vagn Holmboe before him, Poul Ruders is one of the few composers to have written a full concerto for the viola – a ‘musical tribute to serenity and patience’ in the composer’s own words. The Concerto for Viola and Orchestra dates from 1994 but at the time of its first recording in 2015 (Dacapo 8.226149), soloist Lars Anders Tomter cited the work’s evocation of open space and distant horizons characteristic of the Danish landscape. 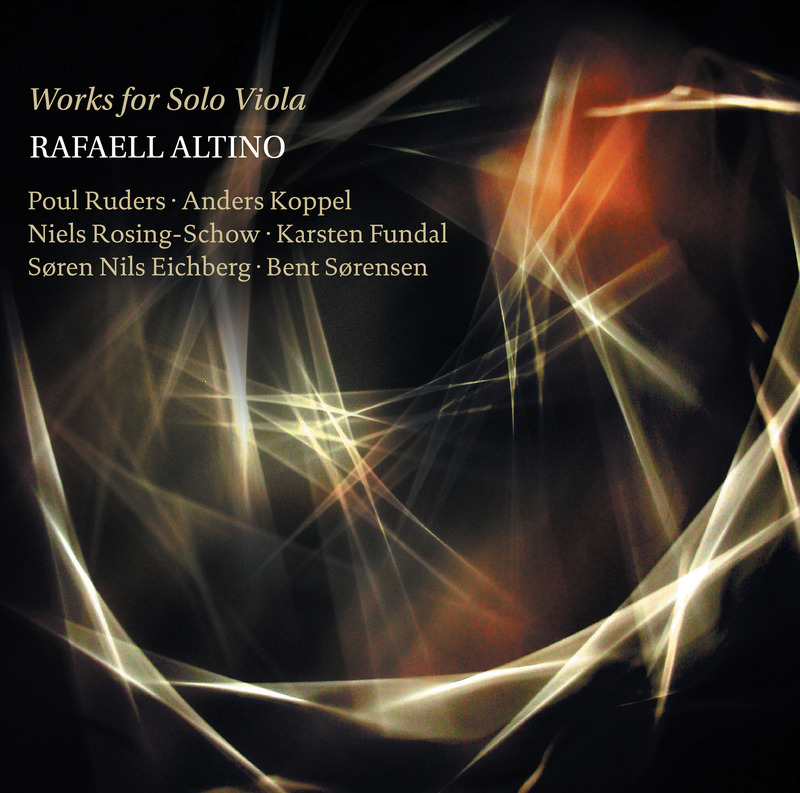 Ruders’ Autumn Collection – like all the music here, written for Rafaell Altino and his viola alone – comprises six movements, two of which explicitly evoke a ‘far horizon’. The first is anchored on a series of fixed notes, initially low then high, that might signify the horizontal band of nature familiar from so many views of rural Denmark. The second horizon is far more distant – high up and wind-blown. The other four movements borrow titles and techniques from the Baroque era in a programme of entertainment, enrichment and disturbance characteristic of Ruders. The Overture shows off the instrument’s brown-coloured lyricism with neo-Baroque grandeur and neat chords at the third and fifth. But here and elsewhere there is something tugging underneath, actively fighting in Prelude, banished temporarily in the fresh, free and open Fugue(unlocking the viola’s sense of solemnity) and returning for more in the double-stop-strewn Cadenza, where we almost feel the instrument fighting with the Baroque aesthetic itself. There are obvious rhetorical gestures from the Baroque era in Anders Koppel’s two-movement For Viola. Koppel, the most un-dogmatic of Danish composers, learned his trade as a practicing musician (not just in classical music) and is always more inclined to let his instruments sing out freely than explore the corners of their expressive capabilities. Paradoxically, that might not be so easy in a work for a solo instrument where any sense of opposition or development must come from within. Koppel relishes the instrument’s most appealing lower-central register. But from that middle ground his viola finds itself caught between sturdy underlay – chant, cyclic pattern, anchoring pedals – and bids for lyrical freedom whether high, questioning glissandos or schoolboy pranks. Eventually, the viola in its most sultry guise dances away with the tango that had been elbowing its way into the second movement, Allegro con brio, almost from the start. Koppel’s piece can be read as a charming tale of the viola’s Cinderella-like emancipation as an instrument. But where his viola dances off like a virtuoso – ultimately taking on the mantle of the violin ‘for one night only’ – #ViolaSoundsby Niels Rosing-Schow looks inward: ‘a journey into the rich sound world of the viola,’ in the composer’s words. Rosing-Schow has long been interested in the idea that music fundamentally charts the passing of time, a concept #ViolaSounds examines with clarity. It is ‘a stream of sound and silence’ in which the viola is ever present while time ticks on, even when it’s not sounding or when it’s fusing from notes to noise. The piece is both stream of consciousness and exquisite monologue; a varied ride through this single instrument’s portfolio. The printed score looks different to any other, even if you’re not trained to decipher its dots and lines: a steady journey through gently transforming terrains whose buzzing intensity speaks almost as loudly on the page as it does vibrating through the air. Each of Rosing-Schow’s discoveries in sonority drills deep into itself, whether the bow is scraping hard, inducing glistening harmonics, or firing off rounds of ammunition. Suddenly, we can expand our list of viola adjectives: tensile, muddy, percussive, rough, tinny, angelic, acidic, ambiguous and more. Like Rosing-Schow, Karsten Fundal has spent years investigating the architectural implications of music’s horizontal march through time and, like both Poul Ruders and Per Nørgård, Fundal has experimented with tools for establishing self-perpetuating structures that can be tipped into action by the composer. But Fundal’s ‘Feedback System’, which combines independently moving layers to create a single dynamic structure, is effectively off limits with a single-voiced instrument. Or is it? Varidrome uses all manner of tricks to give the impression of more than one voice in a dynamic relationship. Sometimes, as in Bach’s famous D minor Chaconne, our mind fills in blanks. At others, Fundal’s extracting of another huge range of sounds from the instrument leads him to explore overtones: notes that aren’t ‘played’, but sound in sympathy with those that are. This creates a mysterious tension of its own as does Fundal’s placing of haloes of shimmering harmonics over ground-out double stops. A minor third is spelt out, in an upward direction, at the work’s very start and again and again thereafter. Eventually, it births a tune and gets it off the ground unfettered, before that same tune floats away. There is something similar at work in Søren Nils Eichberg’s Recitare, but the two movements in this piece go a step further in dramatic terms by using the instrument to push protagonists out onto an imaginary stage. This indulges Eichberg’s interest in the narrative and the theatrical but also proves a chance for him to explore just how chameleonic the viola can be within its established register – even when using conventional bowed sounds. Recitare I dances, laments and drifts off, a victim of its own imagination, but the realism and presence of the instrument’s foreboding C string yanks its assortment of characters back down to earth again and again. In contrast, Recitare II wants to dredge something up from the depths. Halfway through, it comes: an incantation based on a leap more than an octave up that droops back down again like a sigh. It morphes into a full, lyrical phrase, but is scrubbed out by a sudden impulse again born of the growling C string. Many of the words we associated with the viola might also be associated with the delicate, suppressed and whimsical world of Bent Sørensen in his Sarabande. It’s little surprise that Sørensen cast his work for Rafaell in the form of a Sarabande, a triple-metre dance of Spanish origin that often carries with it a residual sadness. Here, rhetorical gestures give us fleeting images not just of Baroque shapes and disciplines, but of the mellow-voiced viol family which gave us the viola in the first place (at the start, the strings of Sørensen’s viola are dampened by a mute). If we feel caught between worlds, it is due not only to that sound but to Sørensen’s teasing out a tune that disappears as quickly as it arrived. For a moment, it feels so bright and innocent, up on the instrument’s penetrating A string. Just as quickly, the viola’s browns and greys smother it into a memory. Perhaps it was to begin with.